Voters are lined up at the Swarthmore-Rutledge School in Swarthmore, Delaware County, on Tuesday morning. The gaggle featured all kinds. Some wore the groggy just-out-of-bed look, while others in business attire nervously checked their watches. Still others had their faces plunged into their cell phones. 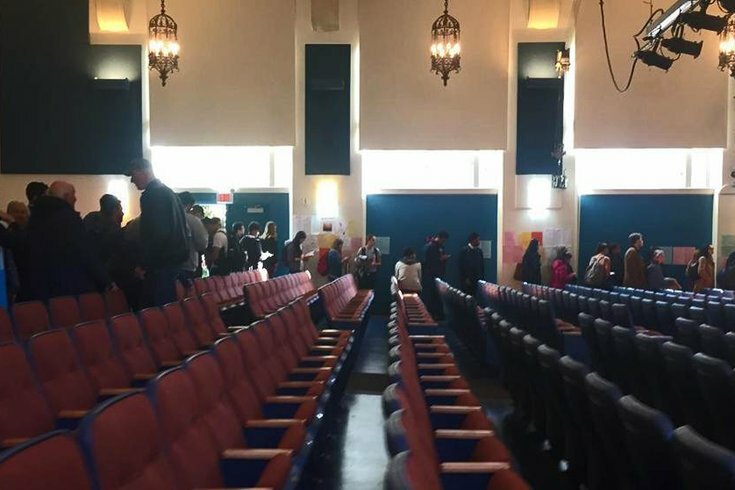 This line was snaking its way around the main auditorium and down the side aisle of the Swarthmore-Rutledge School, in Swarthmore, Delaware County, just minutes after the polls opened on Tuesday morning to determine the next president of the United States. Voter turnout throughout Delaware County was high throughout the morning, and polls were anticipated to get even busier during the evening rush hour. Turnout is reportedly so strong that voter turnout in Delaware County could reach 80 percent of the 375,000 active registered voters, which projects into an all-time record of 300,000 voters participating in the presidential election between Democratic candidate Hillary Clinton and Republican candidate Donald Trump. The reason for the high volume is obvious. Delaware County figures mightily in the election. If Trump can win Delaware County and the other Philly suburbs – Bucks, Chester and Montgomery counties – he has a good chance of winning Pennsylvania and its 20 electoral votes — something the Clinton campaign realizes well. Joe Corrigan, the Delaware County Democratic Party spokesman, saw the same rush as his Republican counterparts. Corrigan has been involved in politics for 17 years. He said turnout is on par with the 2008 presidential election between Barack Obama and Republican candidate John McCain, won by Obama, 52.9 percent to 45.7 percent. George H.W. Bush was the last Republican to win Pennsylvania, in 1988. That was six elections and 28 years ago. Since then, the Keystone State has been blue. Obama won the state in 2008 over McCain by a 10.3-point margin of victory, in a year when Clinton beat Obama in Pennsylvania by 10 points in the Democratic primary. Mitt Romney closed that gap to 6 percent when he ran against Obama in 2012. Corrigan also noted that the amount of information available to voters is unprecedented and far greater than it was even eight years ago. Twitter didn’t become a national social media outlet until 2007, and most people on Facebook were primarily college students when Obama and McCain ran. Robert Oliver, a Springfield resident, caught a good time to vote. He stood in line with his eight-year-old daughter Kaitlyn and got in between the morning rush and the after-work run on the polls that was anticipated. “I stood line for about 10 minutes,” said Oliver, who’s in his late-40s. “I went right after people went to work. I fell right in the middle. My daughter gave me up though. There wasn’t a lot of talk in the line, even though my daughter came with me to see to experience what it’s like to vote. She announced to everyone that we were voting for Donald Trump.